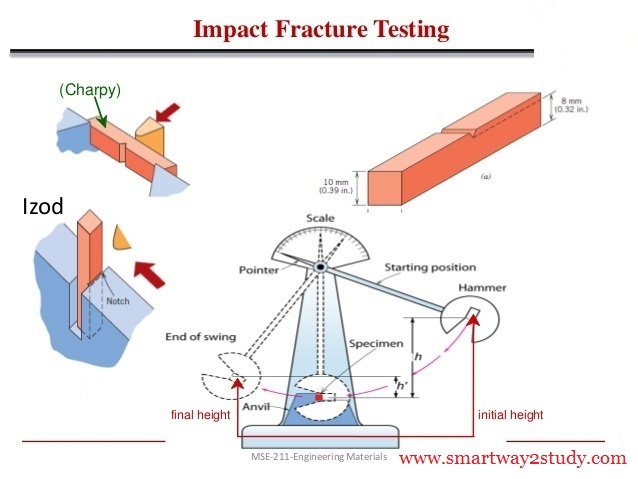 An impact test signifies toughness of material that is ability of material, to absorb energy during plastic deformation. Static tension tests of unnotched specimens do not always reveal the susceptibility of a metal to brittle fracture. This important factor is determined by impact test. Toughness takes into account both the strength and ductility of the material. Several engineering materials have to withstand impact or suddenly applied load while in service. Impact strength are generally lower as compared to strength achieved under slowly applied load. Of all types of impact tests, the notched bar tests are most extensively used. A pendulum type impact testing machine is generally used for conducting notched bar impact tests. The following type of impact tests are performed on these machines.